Sewing accessories & a sewing machine set to straight stitch. 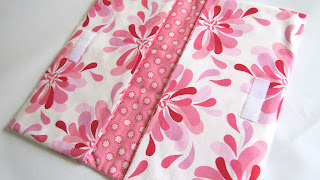 Fold fabric over into nappy wallet position so you can place & pin velcro tabs or any labels/appliques you wish to add. You will need 1 set of velcro tabs on the outer fabric piece inside the wallet as positioned in the top photo of this section. 1 set of velcro each for inside the pockets. They will be sewn on the inner fabric. 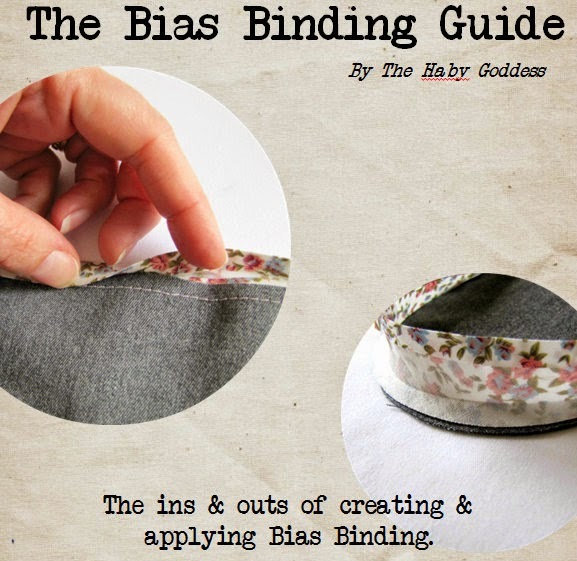 Be sure to allow for seams so don't place your velcro too close to the edges. Measure all pieces so they will match up and are centred. Once pinned, close velcro tabs to make sure everything is aligned and placed in the correct position. 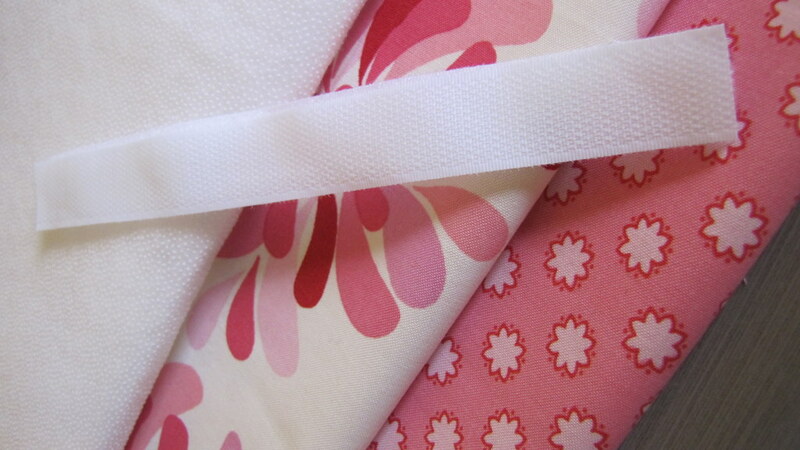 Sew on velcros, labels etc. 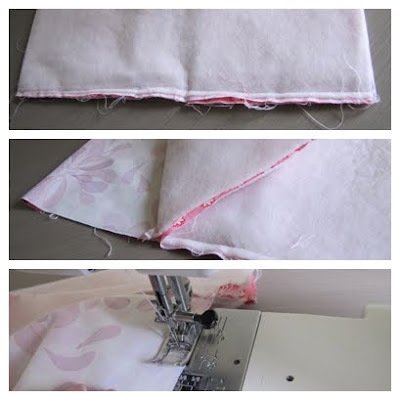 Sew both lot of ends together with a 5/8 seam, turn in and press. Do not press velcro as it will melt! Match velcro tabs in pockets of opened wallet and turn the whole thing inside out while keeping all tabs in pockets together. Do not worry about the velcro tabs of the top material inside the wallet, you do not need to match these. Flatten out the wallet (while inside out) aligning all seams ready for sewing together. 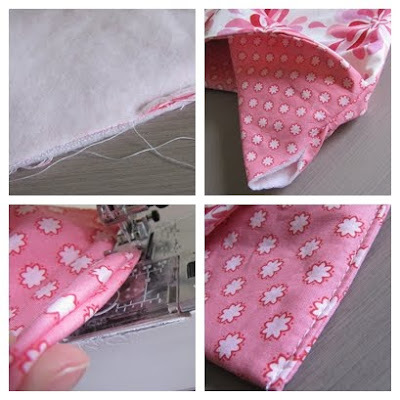 Sew all together along one side of the wallet and then turn inside out to make sure it is sitting how it should be (like when it is finished). If correct, turn back into wrong way ready to sew 2nd side. The 2nd side is a little different because you need to leave a gap so you turn the wallet back into the correct way. Take one end of the outer wallets fabric as shown in the above image and sew up to the middle where you will meet the other layers fold. The pellon & inner fabric to this section will remain open to turn wallet through. 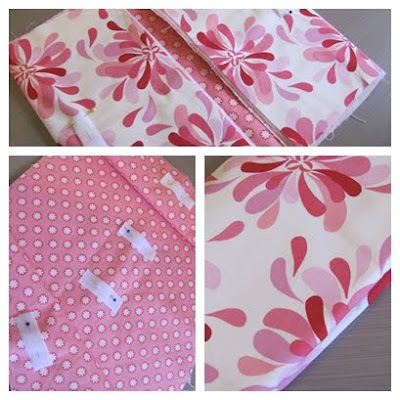 Starting at the opposite end to where you have just sewn your outer fabric flap, sew along side seam, sewing pieces together until you reach where the outer fabric flap has been sewn to. Turn your your wallet through and you will be left with one inner section that needs sewing closed. This will not be visible as it is inside the pocket. You can either hand sew this hole closed or like I did - just fold edges in a sew. It will make absolutely no difference to the finished product. 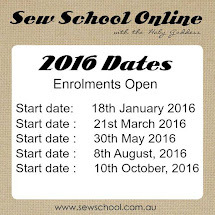 Please feel free to contact me with any queries you may have. too cute! thanks for sharing this.